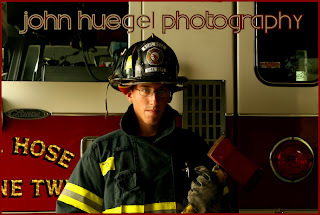 Joe is a swimmer, soccer player, drum major, trumpet player and volunteer fireman. This busy guy took some time out Sunday to capture some senior and family images. It was hot and windy, but not too bad for an outdoor shoot. Short hair does have its advantages! Thanks Joe and family for a great session. And thank you and all the firefighters for what you do. More images are on the way! A lot of up and coming photographers ask me how to get started in the business, or how to increase their exposure. I have given out lots of tips over the years. I decided to put a whole pile of them in one place. Here are twenty great ideas that you can use to build your experience in planning events, working with people, taking great images, and sharing with the community. On the way, you will build a reputation as a reliable, giving person. Aword of caution: Some of these ideas involve taking images of groups of people. Public events generally permit photography by anyone of anyone, but if someone really does not want themselves or their loved ones to be photographed, you should exercise good judgment and diplomacy and stop photographing and/or delete the taken images. For private situations such as nursing homes and shelters, you absolutely must get consent of the leadership team and the subjects. Use these interactions to build your people skills. 1. High School Sports. There are so many sports events that go unreported. If you can get permission to shoot at the sidelines, and you have the right gear, you can get shots that will be memorable and exciting. These can be offered on a low-cost or sharing website to parents and the school or yearbook staff, and you can potentially work with the local papers as well. 2. Student Recognition Events. My kids are in National Honor Society and Scholar Athlete, as well as District Band and other events. It’s no big deal to ask for permission from the administration or advisor and take a photo of every student. Parents love getting a well-taken print, and advisors and yearbook teams love a CD. Whether you have kids in these activities or not, it’s good community exposure and seeing these kids excel reinforces your respect in the younger generation. 3. School Plays. Capturing a few practice shots and dress rehearsal is a great time to build a portfolio for the drama club or department. If you get in early enough, you can work up some really nice posters. Many print labs will print a bunch of 11×17 posters for a reasonable price. Hint – get your business name on there as a sponsor. 4. Humane Society. Who doesn’t love puppies? Often, these agencies need public relations. Whether it’s for a website, newpaper ad, brochures or display boards, any image you take that gets people to support these agencies will be a great service to the agency, and any brand recognition or use rights you can get will be good for your portfolio and reputation. 5. Church Activities. Many churches have baptisms, first communion, dinners, clergy recognition and other activities that involve the church family. Volunteering to be an available resource for these activities will be very much appreciated by the entire church community. 6. Retirement Homes. There are many older folks in retirement homes. Some of them have been soldiers, heros and leaders. All of them would very much appreciate a discussion and a photo. Consider offering to make a book of biographies, photograph visiting families, and capturing special occasions such as holidays or milestone birthdays. 7. Homeless Shelters and Soup Kitchens. Everyone deserves dignity, respect and the opportunity to preserve their memories, regardless of where they are. Talk to the leaders and see if there’s a way for you to volunteer to produce portraits for families who are spending holidays in a shelter. See if you can capture candid images for them to use in their public relations. And roll up your sleeves and wash some dishes once in a while. It will certainly make you a better person inside. 8. Teach a class at a school or boys/girls club. Most young people have an unquenchable thirst to learn and experience life. Showing kids the basic ideas of photography is a great way to interact with kids, and teaching the subject will reawaken those brain cells and get you thinking about photography in new ways. Often you can get your lab to give you a special deal on prints for things like this. Consider letting the kids submit their best shots and have them professionally printed. It will be like christmas for these kids and their families to have their work shown in such a great way. 9. Chambers of Commerce. Joining the local chambers will put you in contact with many business owners. Offering your services to the chamber will be a great way for you to contribute to the organization…and some of those other business owners may need some commercial work done. 10. Charity Fund Raisers. Whenever a local group tells me they are having a fund raiser, I donate a package which includes a session and several prints. The cash goes to the charity, the winner gets a great deal on the session, and I almost always get additional orders from the winners. Remember that you cannot deduct the value of the package, but you can deduct mileage and the cost of the prints. 11. Infant crisis support. This is a very difficult area. Often you will be asked to photograph infants who are dying or in very bad health. As hard as it is for you to handle, the families have an infinitely more difficult situation than you. There are two organizations that come to mind: Now I Lay Me Down to Sleep, and the American Child Photographer’s Charity Guild. 12. Armed Forces families. Consider donating a day or two to photograph armed forces families and giving free or discounted packages for those families who sacrifice so much for our country. 13. Fire Departments and Rescue. These people save lives every day and put their lives on the line. They are proud, dedicated and brave beyond measure. Offer to take photos for the station, and prints for family members. Photograph the new truck. Shoot their practice sessions. Support them in any way you can. 14. Area non-profits. United Way, food pantries, service agencies, local chapters of Heart Association, Juvenile Diabetes…there are hundreds of non-profits that can use your help. Consider donating your time and basic products and offering special discounts to these agencies. You don’t need to give everything away, but find a way to be fair and let them prosper. 15. Holidays. Most public holidays have civic or religious or group recognition activities. Whether they are parades, memorials or other gatherings, being present and contributing images will often be appreciated. 16. Dance studios, gymnastics centers, martial arts studios. Some of these studios may not have established photographers, or are looking to change. Consider offering a free session or offer to do staff images and allow them rights to use in advertising. They have access to many families and kids. 17. Arts Festivals – many communities have cultural festivals. Whether it’s “Garlic Fest” or a food or beverage festival, showing up with the PRESS credentials from the organizers is a great way to be recognized and the images you provide to the promoters will be valuable in their PR. 18. Hobbies. Bikers, kiters, RC nuts, geocachers…every hobby is interesting to that group, and there are opportunities to share that interest with others through newspaper special interest sections, web sites and club activities. Check with local clubs and the paper’s Living section for opportunities. 19. Partner businesses. Pick a frame shop, hair studio, photo store, restaurant…any place that you frequent and would benefit mutually from your products and services, and would be willing to display your products. Approach your dentist, doctor, orthodontist, anyone who you pay, and see if a mutual relationship can develop. 20. Store boards and online boards. If a contractor can advertise in a hardware or grocery store, why can’t you? Even a tear sheet advertising a short-time special could bring in a few clients you couldn’t otherwise reach. And Craigslist and other local boards may pull in a few extra clients. There, 20 reasons to get out and grow! Try to take one of these ideas every month or so and see if you can develop opportunities to expand your brand, your skills and your presence in the community!